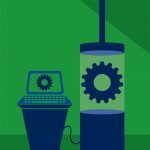 In many instances, plastic materials perform markedly better than do metals—especially in gears. Read on to learn the details that will allow you to make the best choice for your operation. 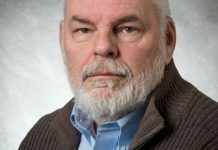 Since founding Timco in 1967, I’ve been riding a steep learning curve regarding plastic materials and the machine parts that we make from engineered plastics. 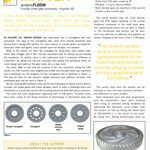 Just when I thought that this strenuous curve was about to level off due to my retirement, my colleagues asked me to write about machined plastic gears. I hope this information will be useful to you. 1) PA 6 (Polyamide 6): this material is wear resistant and absorbs impact even under rough conditions, but it is less suitable for small precision gears. 2) PA 66 (Polyamide 66): compared to PA 6, this extruded polyamide offers better wear resistance (except against mating surfaces of high quality), absorbs less moisture and is dimensionally more stable, but it is also less suitable for small precision gears. 3) PA 6 G (Cast Polyamide 6): the high degree of crystallization makes PA 6 G especially wear resistant. 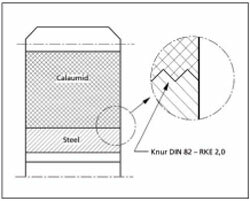 5) Calaumid 1200/1200-FeÆ (cast PA 12): a lower degree of moisture absorption gives better dimensional stability. It has excellent wear resistance and withstands high shock loads. 6) PA 6 G + Oil (Cast Polyamide 6 + Oil): the addition of lubricating oil into the PA 6 G provides very good dry running and wear resistant properties. 7) POM-C (Polyacetal-C): this Acetal absorbs very little moisture, which makes it suitable for precision gears, but it needs continuous lubrication under high loads. 8) UHMW-PE (ultra-high molecular weight polyethylene): PE absorbs no moisture, is dimensionally stable, resistant against chemicals, and dampens vibrations, but it is suitable only for low loads. There are limitations of speed and load for plastic gears, of course. Metal gears usually operate well within the temperature limits of the material. The design of plastic gears, however, must always take into consideration the increase in temperature which is caused by friction, pressure, and speed. The following paragraphs will show how one’s design can safely stay within these limits. 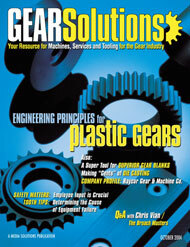 The gear which mates with a plastic gear can also be of plastic, but only in slow and lightly loaded applications. 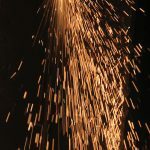 Otherwise, case-hardened steel is the best mating material because it dissipates friction heat quickly. The harder the steel, the slower the wear on the gear wheel and pinion. 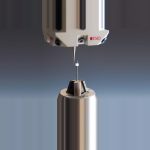 We recommend a surface quality of Rt = 8 to 10 µm, both for dry and lubricated applications. 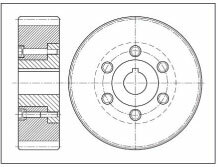 The driving pinion is always subject to greater wear, therefore the pinion should always be of the more wear resistant material (e.g., steel pinion/plastic gear wheel; PA pinion/ POM gear wheel). Automatic lubrication will improve the break-in performance and the overall lifetime considerably. Plastics which are engineered with oil additivesãsuch as PA 6 G + Oilãprovide much longer lifetimes than all other plastics. Continuous oil lubrication results in better friction heat dissipation and longer useful lifetime, or higher load bearing capacity. 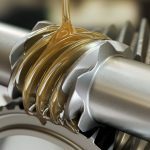 With grease lubrication, the circumferential speed should not be higher than 5 m/sec so that the gear does not sling off the grease. We do not recommend that you lubricate polyamides with water because the material tends to absorb water. 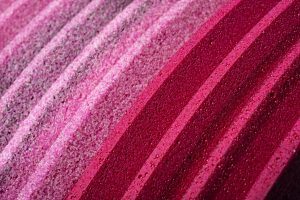 The excellent noise dampening properties of plastics result in a quieter-running gear. 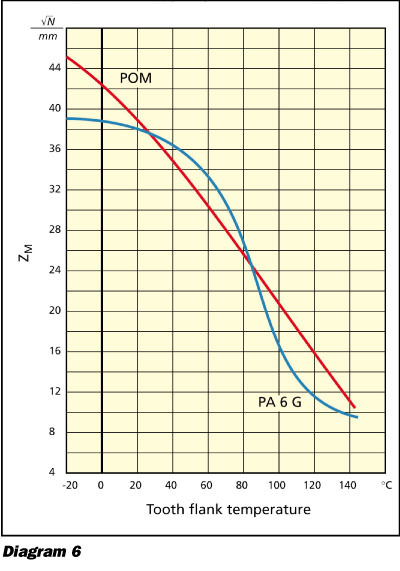 The graph below shows noise generation in dB of steel against steel “a” and of steel against plastic “b” at increasing speeds. The difference is as much as 9 dB. Steel against steel generates up to three times as much noise than does steel against plastic. 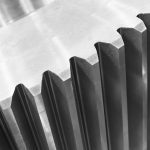 Noise equals wear: When we replaced the noisy steel pinion gears in the drying section of a paper mill with PA6G gears, the noise disappeared, and one could stand a nickel upright on the housing of the running gear. 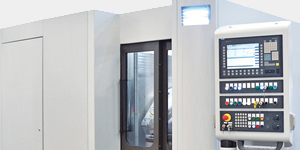 Plastic gears are manufactured with the same machining process as are metal gears, usually milling or hobbing. 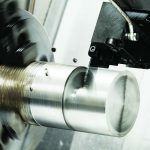 The very low cutting forces permit high infeed rates. This reduces manufacturing cost. 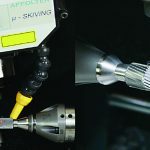 Milling with high rates of infeed may produce a wavy, rough surface which may seem detrimental to long-term performance. 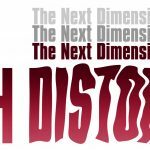 However, the load bearing surfaces of the plastic teeth will become smooth during a dry run-in period. The waviness may even offer lubricant pockets, but it does not lower the quality of the gear. 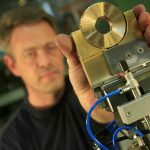 Depending on the modul, gears of AGMA 9-10 qualities can be achieved with the milling of plastic gears. 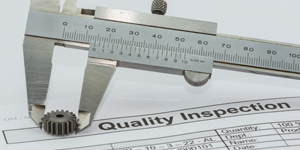 Timco manufactures plastic gears both according to metric standards and according to ANSI. The load bearing surfaces of plastic gears are somewhat pliable, and wider tolerances can be allowed due to the elasticity of the plastic. Therefore, compared to steel gears, the quality of plastic gears can be reduced by up to two AGMA grades. 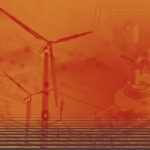 The backlash may be increased–compared to steel gears–by one to two quality grades in order to allow for the effect of temperature and moisture upon the plastic. This article concerns itself mainly with spur gear design. However, plastic can also be used for bevel gears, step gears, herring bone gears, worm gears, and others. 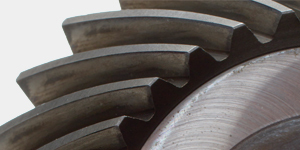 The face width of a plastic gear tooth may be as wide as the gear diameter. The minimum width is limited by the axial stability of the gear wheels. 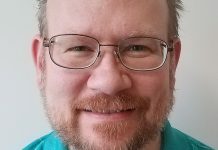 We have no test results for the connection between face width and lifetime, or about the most-efficient face width. However, our experience in many applications indicates that face width should be at least six to eight times the modul of the gear. 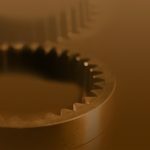 When mating steel and plastic, the plastic gear face should be slightly narrower than the face of the steel gear. 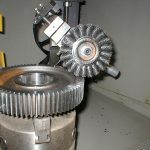 The plastic gear is then contacted under load over its entire width, and no groove can be worn into the plastic face. 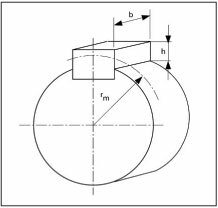 The load bearing capacity of plastic gears is directly affected by the choice of modul and pressure angle. The root strength of the teeth increases if the modul or pressure angle is increased while the transmitted force stays the same. This increase is smaller with plastic gears because the contact ratio decreases and it is no longer possible to engage several teeth simultaneously. A higher contact ratio, however, can be better for increasing the load bearing capacity, rather than increasing the root strength of the individual tooth: For tough elastic thermoplastics, a small modul is preferred (contact ratio increased, several teeth engage simultaneously). 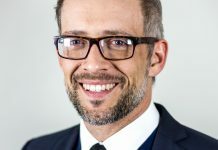 For hard thermoplastics, a large modul is preferred (root strength of the teeth is increased because a higher contact ratio is not possible with the hard material). 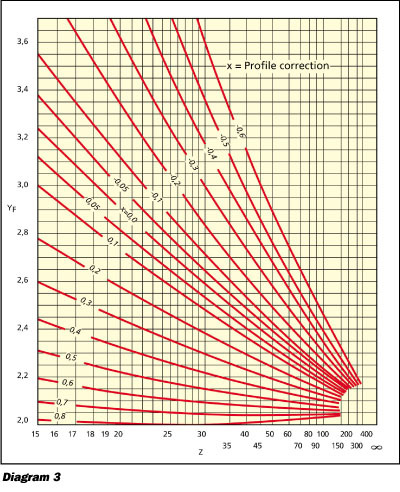 The pressure angle for involute plastic teeth is defined at 20ƒ. Pressure angles <20ƒ result in thinner teeth of less load capacity, with steep tooth profiles but low running noise. Pressure angles >20ƒ produce more-pointed, thicker teeth with greater root strength. The ratio of the number of teeth in high speed gears should not be an integer multiple. The same teeth should not always engage, because this would promote accelerated wear. Helical plastic gears run quieter with a small helix angle than do spur gears. 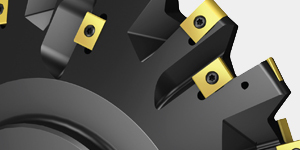 The increase in load capacity, however, is smaller than would be expected with steel gears. The face contact line may be longer and several teeth engage simultaneously, but the load is distributed unevenly and the teeth get deformed. Helical plastic gears are calculated like metal gears, using a spur gear of similar size. b = 10ƒ – 20ƒ is the preferred helix angle. We recommend an initial clearance of 0.3 x modul. This allows for temperature variations of ± 20ƒ.C as well as for tolerance variations. The resulting value must be compared with Diagram 1 . It may not exceed the values which are permissible for the specific plastic material. However, this value does not include a safety factor for shock loads or other reserves. We recommend a safety factor of between 1.5 and 4. Keyways in plastic should be machined with a radius in the corners, if at all possible, because of the notch sensitivity of the plastic material. Another very good alternative design is the material Calaumid 612 Fe® or Calaumid 1200 Fe®. The metallic core is securely connected with the plastic gear. Keyways and keys can again be designed according to traditional guidelines for metal. 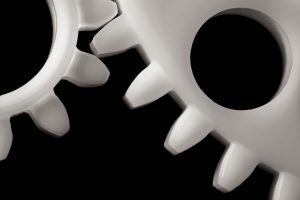 Thermoplastic gears fail prematurely for mostly the same reasons, and with the same symptoms, as do gears made of steel. Therefore, the calculation of plastic gears does not use different methods. The only difference is the inclusion of material-specific properties in the form of correction factors. 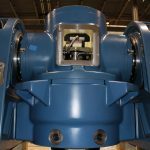 The calculations for torque, circumferential force, and circumferential speed use the formulas which apply to steel gears. 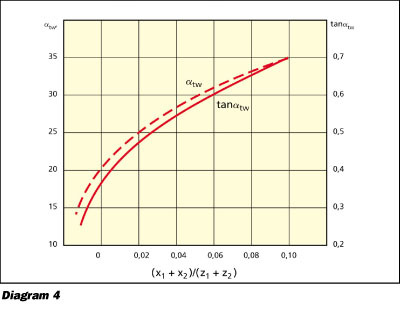 A total cycle time T = 75 min has been established for thermoplastic gears. 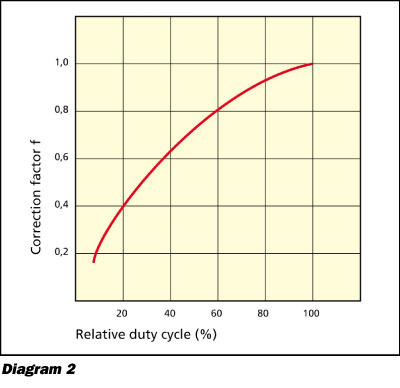 The sum of all individual operating times under load during these 75 minutes is the total operating time t. Using the value which resulted from this calculation, the correction factor f can be determined from Diagram 2. 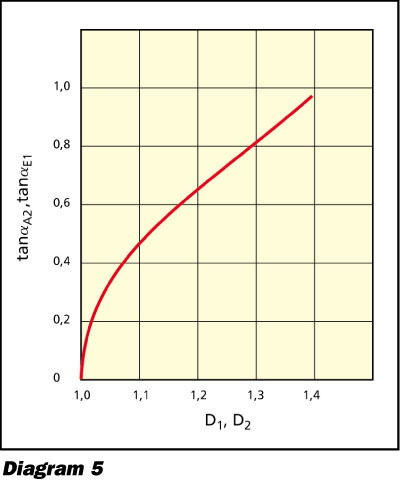 The values of tanaE1 and tanaA2 can be taken from Diagram 5. The effective pressure angles atw and tanatw are calculated from the profile correction x1,2 and the number of teeth z1,2 where Index 1 stands for the pinion and Index 2 for the large gear. The effective pressure angles for spur gears are shown in Diagram 4. 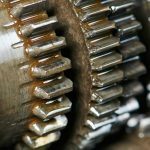 Excessive gear face loading may cause pitting or excessive wear. This wear is concentrated at the root and crest of the tooth. It leads to a change in the tooth profile and, consequently, to uneven motion transmission. This takes into consideration the different moduli of different materials of pinion and gear. The factor ZM for mating of plastic with steel may be taken from Diagram 6. 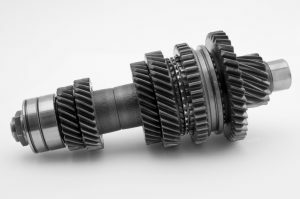 If the gear wheel and pinion are made of different plastics, the factor ZM(K/St) which is valid for the softer plastic should be used. Please contact Timco concerning the diagrams for permissible tooth root stresses and tooth face pressures (contact information at end of article). 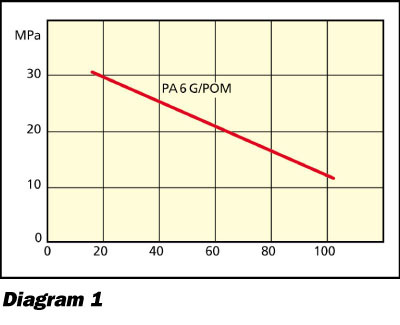 1) PA 6 G + Oil: a polyamide with an additive of lubricating oil which makes it most suitable for dry-running applications. 2) Calaumid 612/612-Fe®: a tough polyamide for shock-load applications. It has a metal core which allows the use of standard steel keyways and keys. 3) Calaumid 1200/1200-Fe®: a pure PA-12 tough-hard polyamide with less moisture absorption and good dimensional stability that is suitable for shock loads, with metal core to permit use of standard steel keyways and keys. 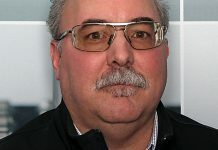 is the founder and retired president of Timco, Inc., a manufacturer and distributor of engineered plastic parts that is based in Peekskill, New York. For more information call (914) 736-0206 or send e-mail to sales@timco-eng.com. The company's Web site is [www.timco-eng.com].